The oldest extant animated feature film, Lotte Reiniger's exquisite shilouette animation took her small team three years and more than 250,000 frames to create. It was first exhibited in 1926, thus stealing a significant march on Disney's 1937 Snow White and the Seven Dwarfs. Scooping the flying and fantastical elements from a handful of Arabian Night stories, chosen to show off the transformative possibilities of Reiniger's delicate hand-snipped animations and settings, this is a wonderfully inventive piece. It's far from a saccharine fairytale, its images jaw-droppingly pliable and protean for early animation. Watching the African Sorcerer stretch himself into a kangaroo or duel with the Fire Witch as a sinuous, snapping succession of animals (a sequence so effective that it was recreated in Disney's The Sword in the Stone many year's later), you can see an inventive fierceness about the film's set pieces. Filigreed and elaborate, the figure outlines nimbly articulate their characters. Manipulated with balletic grace they swoop giddily through avant-gardist Walter Ruttman's tinted multi-plane landscapes, which give the film a more abstract feel than other Reiniger adaptations. - Kate Stables, Sight & Sound, October 2013. 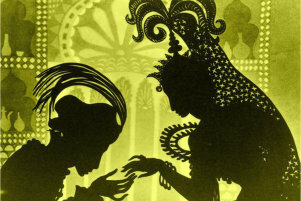 Like many silent films, Prince Achmed breaks neatly into its five acts, and there are times when it seems like it might have originally been conceived as a serial. This makes for an action-packed film that seems bigger than the sixty-five minutes it runs at 24 frames per second, since every segment is packed with enough story and action to survive on its own. The writing is not always perfect - when Achmed meets Aladdin, it suddenly seems like much more time must have passed during his adventures than we'd previously assumed, and the witch is powerful enough that the movie's title character winds up practically on the sidelines during some of the confrontations with the sorcerer. Reiniger makes up for that in making her characters surprisingly expressive, considering the medium. Though this is a fairy tale retold, the personalities are clear and amusing, from the sorcerer's uncaring shrug when Achmed is carried away to Achmed clearly having a good time when his crash-landing on Wak-Wak lands him among the Princess's handmaidens. There's a bit of awestruck kid in Aladdin. Of course, there's also some caricaturing done for the African and Chinese characters that may not fly today, even considering the abstracted nature of silent cut-out animation. Transferred in high-definition by L'Immagine Ritrovata from the 35mm restoration prepared by Deutsches Filmmuseum Frankfurt. The presentation features a stereo recording of the original 1926 music score by Wolfgang Zeller.